Cal football was winding down from a strenuous workout when strength and conditioning coach Cheryl Cox was preparing to head out. As the players and coaching staff grouped together for an uncomfortable conversation, a coach told Cox to stay. Nobody batted an eye. Football has always been seen as a brutish sport — a “man’s sport” — a place in which women are rarely present. The machine that is Cal football contains hundreds of moving parts, and one of its revving engines is its strength and conditioning program. On a staff of five, Cox is the only female trainer, and both the other coaches and players respect her for what she is — a coach. “Walking into that weight room in the morning and seeing all the male strength coaches and Cox is really inspiring,” Cal beach volleyball senior Teya Neff said. For most people, getting laid off is a worst nightmare come true. Cox, however, is not most people, and true to her nature, she managed to find beauty in the chaos. After being a casualty to budget cuts at her biological research lab, Cox realized she was handed the golden ticket to do what she was truly passionate about. A Cal graduate in 2008, Cox received her degree in integrative biology and went on to do research on heart disease and cholesterol at University of California, San Francisco for about three years. During her tenure as a scientist, she was published in journals for lipid research, along with clinical endocrinology and metabolism. “I got laid off and I was like, ‘This is perfect, right?’ I kind of wanted to quit anyway,” Cox says. Whether it be studying biology, physiology, anatomy or aspects of exercising, Cox had an infatuation with the body and its moving parts. In addition to loving to study exercise, Cox considered herself a gym rat. When she lived in San Francisco with her girlfriends from college, even happy hour could not keep her from getting in her daily gym session. After her fortuitous firing, Cox set her eyes on relocating to Washington, D.C. There, she would apply to George Washington University’s exercise science program with a concentration in strength and conditioning . “I literally just applied, got in, packed up and moved. Within six months, (I moved) to D.C. and started my schooling,” Cox says. Following an internship at Georgetown, Cox got offered a position on staff and began working with Georgetown men’s basketball, women’s basketball, football and sailing programs. Her term on the East Coast, however, would be short-lived. The next stop on Cox’s road back home was a quick stay in the beautiful Malibu, California at Pepperdine University, where she would oversee cross country, women’s track and field and women’s swimming and diving programs. But as much as the habitable beaches and sunny SoCal weather made it hard to leave, an opportunity to intern with Cal football would bring Cox full circle back to the Bay Area. Cox will tell you with an enthusiastic cheer that she bleeds blue and gold, and if you didn’t believe her, you could simply take a visit to her house. After the 1923 original Cal football stadium was torn down, a shop called the Wooden Duck in Berkeley preserved wood from the project, and they provided quite a bit of Cox’s decor. 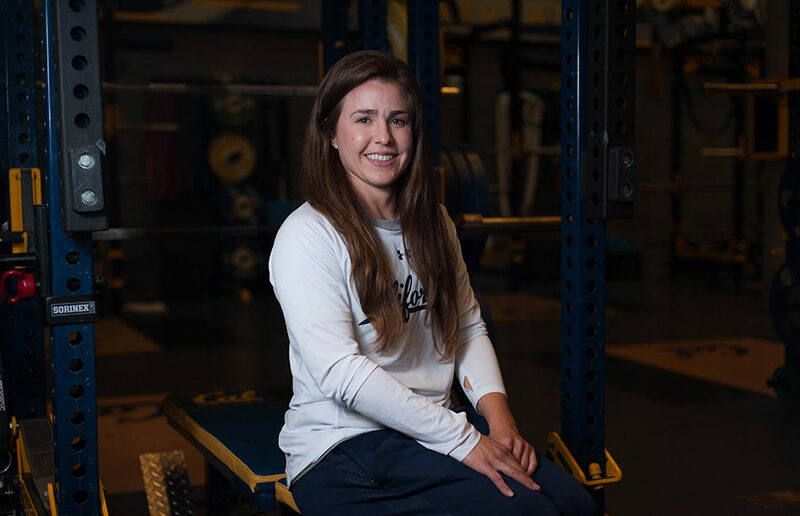 Since beginning her professional career at her alma mater, Cox has taken on various positions, including assistant strength and conditioning coach for the football team, head strength coach for the beach volleyball and women’s gymnastics programs as well as a position with the softball program. Cox runs the football team’s Sports Science department — she knows what is going on inside her players’ bodies at all times, she knows when to push them harder and when to pull back. Using GPS devices that the players wear, Cox can track everything a player does in a workout. She tracks their movements, heart rates and everything in between. Throughout practices, Cox keeps real-time information on a computer and monitors and records what is happening to her players’ bodies during workouts. After she uploads each player’s individual tracking system information, she analyzes the day’s work and assesses what past workouts, future workouts and potential changes to the training regimen should be made. Heading into her third fall camp with the Bears, Cox knows her players and what their performances should look like, and she will accept nothing less from her athletes than their all. It is a common saying that you have to separate the boys from the men, and on a football team in the Pac-12 conference, that may seem true; but what separates the men from the women is actually very little, according to Cox. But to her teams, Cox is so much more than just a conditioning coach — she is a role model. The same attitude and encouragement that Cox beams to the athletes she works with is a direct reflection of her confidence and security with herself. Sometimes she even forgets she is a woman in a predominantly male industry, because at the end of the day, her desire to win and achieve the overarching team goals conquer any sense of a gender binary. Women in the sports industry are often the targets of harassment, but Cox said she has not encountered those situations in her workplaces. While Cox has never had an issue with her fellow coaches nor her players showing a lack of respect for her because she is a woman, she understands the restraints that are put on her field of work. In both NCAA football and men’s basketball, the number of female coaches of any kind are few and far between. Regardless of her responsibilities, Cox remains true to herself. Men or women, starters or nonstarters, coaches or players — it simply doesn’t matter. From the laboratory and research fields to working hands-on with some of the most elite athletes in the country, Cox has worked in two industries that have historically been male dominated, sexist and exclusionary, but she has never cowered in the face of adversity. “I always say, ‘Grateful for everything, entitled to nothing.’ If you have that perspective where every day is an opportunity for you to get better and every day is an opportunity for you to do something uncomfortable and improve and become a better version of yourself, you’re going to be in a good spot,” Cox says. Christie Aguilar covers cross country. Contact her at [email protected].